MANILA, Philippines - The official results, list of passers, top examinees, performance of schools and other important announcements for October 2017 Certified Public Accountant (CPA) board exams are released by the Professional Regulation Commission ten (10) working days after the last day of exams. 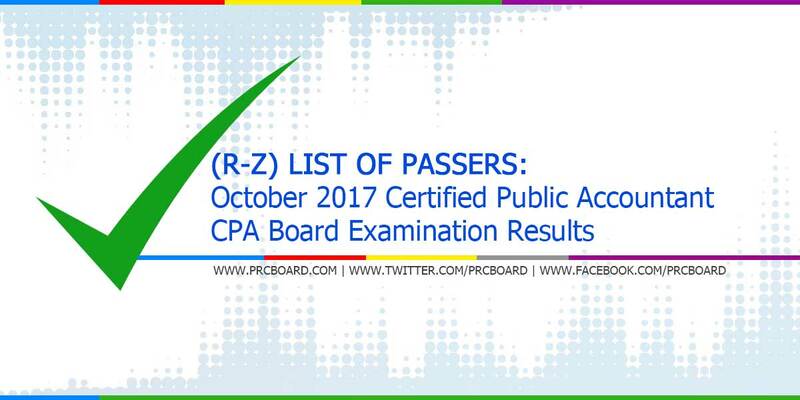 Below is the list of passers for October 2017 CPA licensure with surnames starting with letter R to Z. NOTHING FOLLOWS---------------------- CPA Licensure exams is one of the programs with most number of examinees being administered by PRC. Tagal naman. Yung tarpaulin ko dito yari na. �� Werpa werpa PRC. Where is the result??? Why so tagaaaaaaaaaaaal! what time po ang release ng passers? Ilang oras na lang CPA na tayo!!! Gustong gusto ko ng maging CPA Lord please kasama sana name ko sa list of passers. ang tagal naman... naka display na iyong tarpaulin ko sa munisipyo. Hihimatayin na po ako sa suspense. Gaano pa po katagal? Especially to Ana Lea Naraja Tizon, CPA. Keep waiting, 'coz God is doing His Will. Sana maging CPA na po ako pls. For my family 💙 God bless us all! Lord, I know You are with me. I know this is for me, this is my time, and I know I will become a CPA. Amen! CPA na AKO.Amen,Thank you Lord. CPA na ko.Amen, Thank you Lord. ang tagal naman. tutulong na kami mag update.